We’ve had the chance to talk to Jasilyn Albert, 27, an American expat who has moved to Russia alone. Ms Albert, who has been living there for seven months, now works as a teacher. A: I wanted a new experience. I knew if I lived in the USA my whole life I would look back and regret not taking the opportunity. Also, my sister and cousin both lived outside of the USA for several years, so it runs in the family. A: I am living in Ufa, Russia. 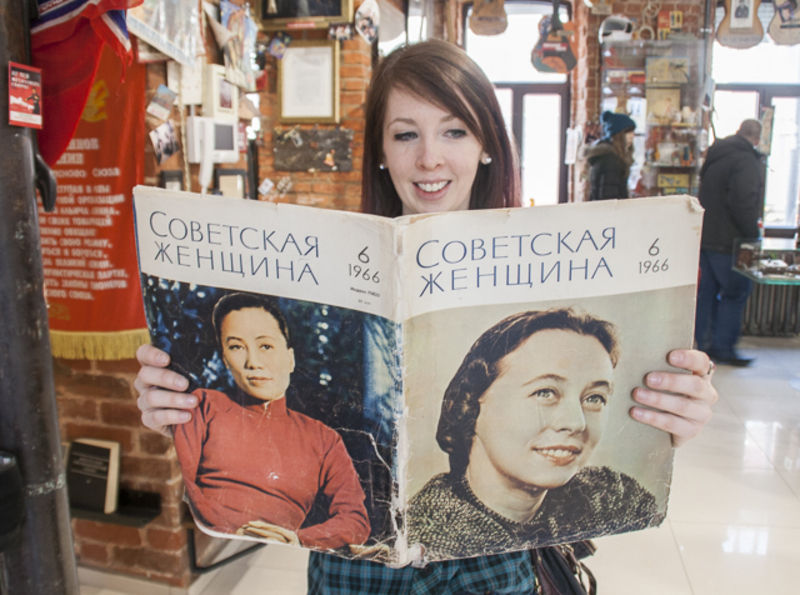 Since high school, I have been interested in Russian history and learning the Russian language. I thought about moving, but I never actually considered it until a friend from college said his school was looking for someone to replace him. Q: How long have you been living in Russia? A: I have been living here for seven months. A: I am living here alone. A: Of course. I especially get homesick around big US holidays, but sometimes I’ll get homesick randomly. A few weeks ago I went to IKEA,and I just imagined what it would be like to have my own apartment with all my stuff from the USA. I was very homesick for about a week after. Fortunately, I’m very introverted, so it’s easy for me to spend extended periods of time away from family. Also, living away for college helped ease the transition too. I also have American friends here, and that helps especially when going through culture shock because they can relate to my experiences. A: Russians are extremely hospitable and generous. So many Russian stereotypes were debunked when I got here. One thing I could do without is how some locals love to talk about politics especially the political situation between the two countries. I try to avoid talking about it. Q: Was it easy making friends and meeting people? Do you mainly socialise with other expats in Russia? How did you manage to find a social circle there? A: It was easy to make friends, but it was hard to make good friends. I used some social network sites to meet people, which made the initial process easy. Sites like couch surfing made it easy because most people on there speak English. There aren’t many foreigners in my area, especially foreigners who speak English. So many people wanted to meet up with me to practice their English. It was flattering but also overwhelming. It took a few months to make good friends, and actually most happen to be expats from other countries. Q: How does the cost of living in Russia compared to your home? A: So, the cost of living in Russia is much cheaper, like rent, gas, and water. However, most things like entertainment are expensive because they are based on global prices. They don’t seem expensive, but if your salary is in rubles, then it seems really expensive. A: A cup of coffee here is about the same price as the USA. It might be slightly cheaper, but I think tea is much cheaper here. A: An inexpensive meal is about $3 compared to about $5 or $6 in the USA. A: I don’t really eat out, but the most expensive I’ve had is about $7-$15. I guess I should put in perspective that I only make about $5 an hour. A: Wine is pretty cheap depending on where it’s from. Foreign wine from the USA and Western Europe tends to be more expensive than wine from the former Soviet Republics. I usually buy wine from Crimea or the Caucuses, and it’s about $3 a bottle. I never buy cigarettes, but I’m assuming they are pretty cheap because a lot of people smoke. I think it’s right around $1 per pack. Q: Do you have any tips for future expats when it comes to opening a bank account in Russia? A: I honestly don’t know much about setting up a bank account. Luckily, my employer helped with the entire process. A: It was such a hassle to get a visa. It is also very expensive. Russia loves paperwork and stamping paperwork. Everything has a stamp, even when you buy stuff at the store. I did my visa myself, but there are a lot of sites out there that will help you apply. I think it’s most important to keep in contact with your employer and not be afraid to ask questions no matter how stupid they sound. You also have to submit a letter of invitation and proof of an HIV test with your application. Q: Would you say that healthcare Russia reliable? Any preferred clinics or advice for expats? A: Luckily, I haven’t had to deal with Russian healthcare. I know my American friend has gotten pretty sick. She was so sick one day she had to be taken to the hospital in an ambulance because she wouldn’t stop vomiting. They ended up making her leave that night because she had American health insurance and not Russian. One piece of advice that I would give expats is that unless you are maybe in Moscow, you probably won’t find doctors who speak English. Make sure your employer is willing to help in such situations or maybe find a friend who speaks Russian. Q: Did you secure a health insurance in your home or Russia? What should be the essentials in the coverage for expats, in your opinion? A: I actually don’t have health insurance from either country. Q: What was the most memorable about the packing and moving process to Russia? Which was the mover you chose and how was your experience with them? A: I came with the intention of eventually leaving so most of my stuff is still in the United States. A: The biggest challenge I faced was not being able to speak the language. Everywhere I have travelled I either knew the language or I was in large tourist areas where people spoke English. I assumed it would be the same in Ufa, but it wasn’t. I really struggled in the beginning. Q: What do you think are the positive and negative sides of living in Russia? A: The positive sides are that everything is cheaper, the culture is really fascinating, and the people are so nice. The negatives are the language and the political situation with the West. A: Ufa isn’t too exciting, but the local food here is really good and there are so many parks to walk through. A: I haven’t decided yet. I know eventually I would live to move back to the United States and start a family, but I think I want to stay abroad for a little longer. It all depends on my financial situation. American universities are not cheap. A: Learn the alphabet before you come. It’s really easy. Find a Russian tutor as well. Russian is difficult to learn and I, personally, need that motivation from someone to learn it. Also, be careful about speaking English too loudly, especially on public transportation. Some people are not as accepting of foreigners. Q: Do you have favourite websites or blogs about Russia? A: I recently came across the blog Lets Love Local. She was a former Russian expat, and I think she has good information about exploring new cities. Also, the I LOVE the app 2Gis. It gives you routes to and from places in your city and works offline. You can even find recommendations for places to eat or things to do. The only downfall is that most of it are in Russian. I write about my own experiences and places to see on my blog Coffee + Cleveland.